Flip Out Mama: Glow Crazy Glow To Go Review and #Giveaway! I am so excited to announce that I am a Glow Crazy Brand Ambassador! I love Glow Crazy products, and I was so excited to be able to work with them again!! 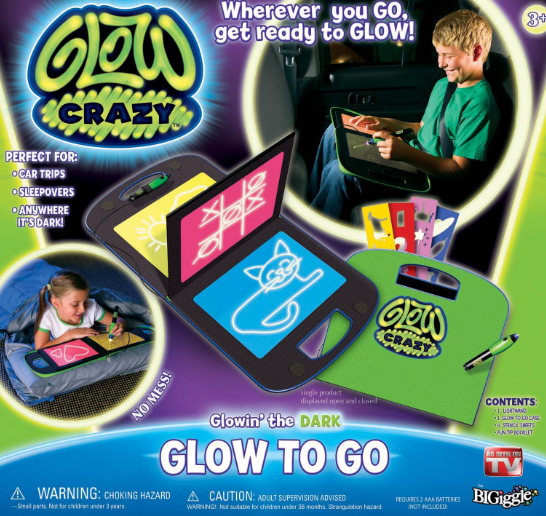 Tater really loved the Glow Crazy Distance Doodler, so we were really excited to get to try the Glow Crazy Glow To Go this time around! Now, let me start off by saying I am always trying to find products to keep the boys busy in the car.. This one is perfect for Tater! He is crazy about drawing, coloring and art anyway, so this was right up his alley! The Glow To Go includes four different colored glow pads, a easy to carry handle, and a lightwand (attached with a string so it won't get lost!) I liked the fact that it has a pocket to keep the stencils in.. We had a really hard time keeping up with the Distance Doodler stencils, so this will help a lot! We do a lot of driving at night, so this was great for Tater to keep busy in the car. He seems to have an aversion to sleeping in the car, so I was happy to see him find something to play with! Just like the Distance Doodler, this quickly became one of his favorite toys, and I was really happy to be able to get a chance for him to review it! I invite all of you to check out the Glow Crazy site and all of their cool products!If you are interested in buying the Glow To Go, they retail for around $19.99! One Lucky Flip Out Mama reader will win a Glow To Go of their own! Here's how to enter! Mandatory Entry: Leave a comment telling me who the Glow To Go would be for if you were the winner! +1 Follow Flip Out Mama via Google Friend Connect (if you already follow, leave a comment telling me so!) sign up on the right side of this page. +1 Follow Flip Out Mama via Networked Blogs (if you already follow, leave a comment telling me so!) sign up on the right side of this page. +1 Follow Glow Crazy on Facebook here and tell 'em Flip Out Mama sent you! +1 enter any of my other current giveaways (left sidebar) and leave a comment for each one! +1 EXTRA ENTRY PER DAY!! Tweet about this giveaway, post it on your facebook, blog about it. Make sure you leave a link to this page so others can enter! Then come back here and leave a comment telling me where you posted (leave a link to where you posted also) You can do this extra entry EVERY DAY! This is a great way to build up entries in the giveaway! This giveaway will end on 9/7/2011 at approx 11:59 pm est. The winner will be chosen via random.org and will have 48 hours to respond to email notification or an alternate winner will be chosen. US residents only. Sponsoring company is responsible for fulfillment and shipment of prize. I was provided with a sample product in order to conduct this giveaway. Although a sample product was received, all opinions are my own and no monetary compensation was received. It would be for my youngest son. My daughter drives me BATTTTTYYY on long car rides- this would- without a doubt be for her! If I won, I would give it to my 5 year old. I entered the sportscraft giveaway. I entered the frito lay giveaway. i entered the suave giveaway! I would give this to my niece. She loves to draw. This would have to go to my grand daughter Brooklyn- she loves being artistic & hates boring car rides. it would be for my son...he would love this..